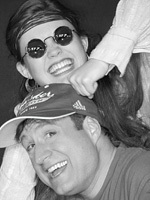 JOHN & JEN is a nightmare of a musical, beautifully, even powerfully, executed by the Bus Barn Stage Company. David Curley as John makes a so-winsome little boy, clutching his teddy bear (a hand-me-down from Big Sis). When he hunches his shoulders and does that Pooh kind of walk, he looks as much like the bear as the boy. And Kristin Stokes as Jen is completely rangy; though she starts with sugar and spice, she progresses to Midwest talk-show caller and insinuating talk-show host with equal aplomb, and she has a facial expression for every day of the year. Yet for a million reasons this baby boomer "life and times" overview is exhausting. For one thing, it's a musical with only two characters, a sketchy plot held together by themes, no chorus or chorus line and no full orchestra not to mention precious little dialogue. Act 1's story of two siblings with an abusive father morphs into the story of an overprotective mother and her son in Act 2. (Toss out continuity.) It is staged sparsely, as a box production—three boxes with a flag draped over them for John's casket. The ubiquitous Ron Gasparinetti's set design may not advance the times, places or story line much, but the baby-blue and white theme of the set screens is rather ingenious, white cloudish puffs on a blue background—except for the rear screen which is inverted, blue on white, and the blue turns to a broody, muddy brown under blue lighting. Yes, something wants to soar, float and fly in this show; we get that from Jen's song about wanting to be an eagle (couldn't it be a condor or raptor?). Perhaps I'm cynical for thinking the lyrics dull—"Every goodbye is a hello"?—and that the themes feel like overdone talk-show topics. Still, Andrew Lippa's musical brutality can drive Tom Greenwald's worn lyrics into the nerves around universal yearnings. Songs become poignant mostly because we know how true they aren't. The "I'll be there for you" and "I won't fail you like I failed him" serve as reminders that we can't be there for everything, and we probably will fail him/her/them again, more than once. Hats off to Curley and Stokes for incredible mood changes in a single number, countless impeccably meshed duets, plus the ability to change clothes and move scenery on the fly. And the talk-show sequence (spanning the '80s) is a lively, funny piece of theater. Bus Barn has supported the music with an excellent, live, three-piece combo (cellist Tanja Paolini, keyboardist Michael O'Dell—alternating with Jonathan Erman—and percussionist Mark Cepeda). These three musicians carry the entire emotional landscape on their fingertips. Lippa's music is nothing if not exuberant. But it's all about textures and mood (that spray of tinkling bells, for instance, signaling "get misty for me") and surprisingly bankrupt on some intimate level, like glops of brilliant composition thrown against a story board waiting to see what sticks. It can also be annoyingly functional: change moods equals change keys; to escalate intensity, modulate up. But if you relate to the themes at all, this two-hour wash cycle (soak, agitate, spin and drain) may put you through the emotional wringer, even while putting you to sleep mentally—go figure. And Bus Barn has done everything humanly possible to breathe the life force into this Lippa-Greenwald concoction.